Dental Implants vs. Dentures from www.VideoCC.com on Vimeo. Our patients at Reem Kidess, DDS, PLLC, dental center, no longer have to consider missing teeth as a challenge – or that their only option is dentures, partial dentures or bridges. The dental implants Scottsdale, AZ patients have been waiting for have evolved over the past 60 years, and are now considered the standard of care for the replacement of missing teeth. The success of dental implants Scottsdale has been scientifically proven and documented. Scottsdale dental implants can be used to replace a single tooth, or multiple implants to restore an entire edentulous arch. Here at our dental office each case is studied individually, and necessary models, x-rays and 3D imaging as needed are taken to pre-address our patient’s needs and wants. In general, the dental implants Scottsdale, AZ patients want to learn about are made of titanium roots that are placed either in a healed extraction socket, or immediately in an extraction site. Bone grafting may be necessary at times and, of course, is always planned for in the treatment plan phase at our dental Scottsdale office. At times a temporary crown can be placed same day as the implant, (immediate load), to avoid having to wear a “flipper”, or temporary partial denture. At our Scottsdale dental office we will always discuss all options with you before treatment is initiated. To restore a single tooth implant – either a screw-retained crown is designed or an abutment retained-crown. 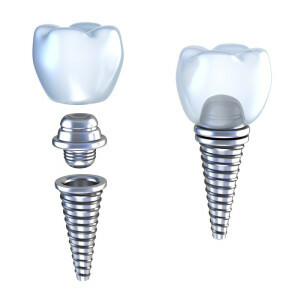 With a screw-retained crown, a tooth like crown is screwed directly into the implant with a titanium screw, and then the access hole is sealed with a filling. With an abutment retained crown, an abutment made of gold, titanium or zirconia (tooth colored) is directly connected to the implant with usually an internal connection and also a titanium screw, then a crown is fitted precisely on this abutment – this option often produces the most life like results. At our dental Scottsdale office we will look at your entire smile, bite, plane of occlusion and plan for the optimal restoration. In a case where multiple teeth are missing, each case is unique, and the number of dental implants Scottsdale required to replace the missing teeth takes into account many factors including bone level, quality of bone, supporting teeth and structures. In some cases an entire arch can be restored with a fixed bridge with just 4 implants (e.g. Nobel Biocare’s All-on-4 system), in other cases, 2 to 4 implants can anchor a denture. There are usually options for every case, and implants may be the right and optimal choice for you vs. a bridge or dentures. Do not hesitate to ask Dr. Kidess, or the team here at your Scottsdale dental center, if dental implants are right for you. With more than a decade’s worth of experience, Dr. Kidess is the implant dentist Scottsdale is fortunate to have.